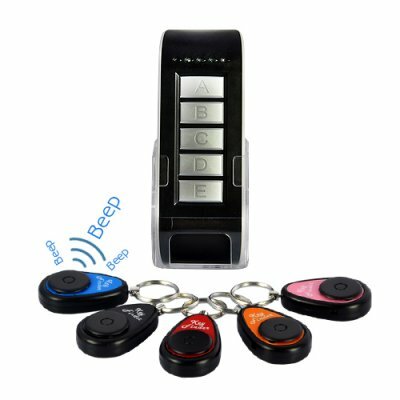 Successfully Added Wireless Key Finder Set (1 Transmitter, 5 Receiver) to your Shopping Cart. If you’re looking for a solid resale item that can make you some great profit before everyone else, then this key finder is that product. Place your orders today while supplies last and we will express ship it to you by tomorrow. This key finder comes with our famous 12 month warranty and is in stock now in our warehouse right now. Brought to you by the leader in wholesale electronics, Chinavasion. I have some on my keys and I gave a set away and they are getting well used. I have them on keys and phone, the things I loose regularly. Unfortunately they are not loud enough for the workplace as I had hoped, but great at home. on 2011-11-23 05:27:34 Great product! Bought 3 pieces, 1 for my one. I always lost my keys, so I add them on all my keys. Works very good, all the batteries are included, and the quality is very good. To learn each keyfinder, switch it on, and then press on the transmitter one of the 5 buttons, thats it. The range is even more than 20 meters, I think its 2x more.